Our range of products include metal hex bar. 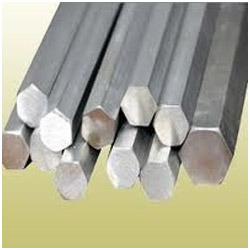 We are one the well-known manufacturers and suppliers of Metal Hex Bar. The offered metal hex bar is designed in the shape of a hexagon. Our supplied metal hex bar is made from metallic alloys such as nickel alloy, copper alloy, bronze alloy and brass alloy. The offered metal hex bar is available at much budgeted costs. Looking for “Metal Hex Bar”?